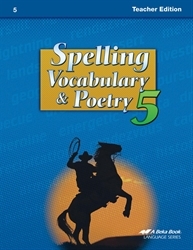 Keep spelling, vocabulary, and poetry interesting with the added features of this Teacher Edition. Complete with a copy of the student book plus answers inserted, you can quickly check your child’s answers to the word exercises. Study Helps, Teacher Notes, and Sentence Banks are also included to help you instill spelling rules and correct usage of troublesome words. Also included are introductions and vocabulary words for each poem plus a poetry CD to help your child correctly express these poems.